The Vimanam is in 3 tiers. The Lord gives darshan in the first tier in Sitting Posture. In the middle as Ranganatha in Sayana with Sridevi and Bhoodevi and in the top tier in Standing posture. Vishnu Bhaktas pallava and Villava, the sons of King, Viroshan of Vidharba desha performed Ashwameda Yagna at the Punyakoti Vimanam and the Lord gave darshan to them as Paramapada Nathan (Vaikunta Nathan) and is giving darshan to this day. Thirumangaialwar - 1128 - 1137. Very near to the Periya Conjeevaram Railway Station. 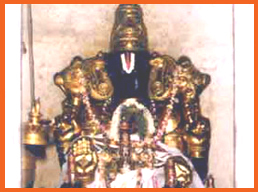 The Moolavar of this sthalam is Sri Paramapatha Nathan. Also called as "Vaikunthanathan". Moolavar in sitting position facing west direction. Prathyaksham for Pallava King.